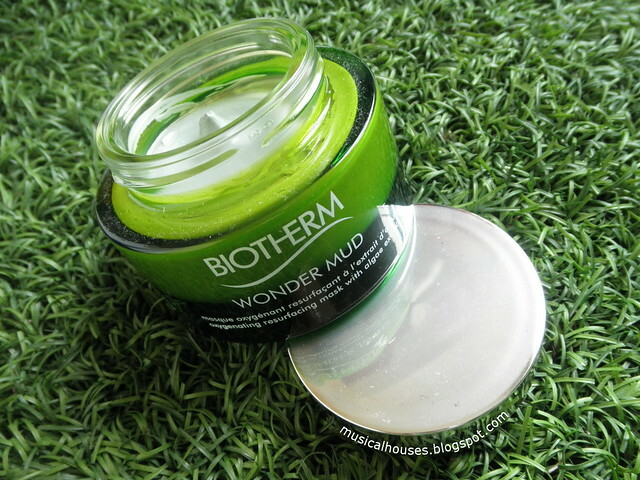 Biotherm's Skin Best Wonder Mud is a mud mask, and was launched earlier this year. I've had this for awhile, and finally got around to reviewing it, after a few months! Well I guess better late than never right? (Ignore the crickets chirping, will you, LOL.) 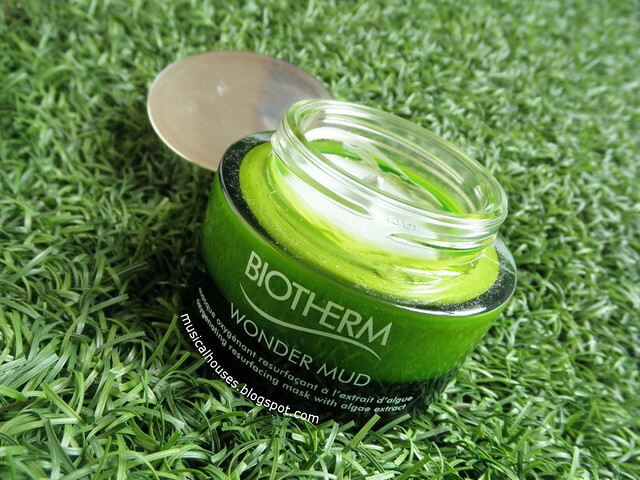 Anyway, Biotherm's Skin Best Wonder Mud claims to have the antioxidant Astaxanthin to combat dullness, as well as Ghassoul mineral clay to absorb oil and impurities. As the website eloquently puts it, "antioxidant superpower (Astaxannthin) has 100X more antioxidant than Vitamin E and Ghassoul clay are combined to form a mask that truly combats city toxins, grime and free radicals that attack our skin every day". Sounds exciting, right? What's interesting about the Skin Best Wonder Mud is also its application method. Unlike traditional masks where you leave it on for anywhere from 15-30 minutes, the Wonder Mud mask is designed to be a quick fixer-upper for your skin that can be used in a few minutes - in fact, Biotherm recommends 3 minutes, so that you can use it even if you are in a rush. Basically, you apply the mask to your skin, let it sit on your skin for 3 minutes, and then you rinse it off, massaging the mask as you do so to get the exfoliating effect of the "crushed apricot stones". Biotherm recommends using the mask twice a week. So, we do have a pretty interesting product to look at today, and we'll also look closer at the Astaxanthin in the product. So, let's begin with my favourite thing - a look at the ingredients list. I didn't have a copy of the ingredients list with me, but fortunately a bit of googling turned up the ingredients list, so here we go! The ingredients in the Biotherm Skin Best Wonder Mud are primarily water, clay (Kaolin), humectants (Glycerin), Alcohol Denat., emollients (Isononyl Isononanoate, Cetearyl Alcohol), and Apricot Seed Powder. 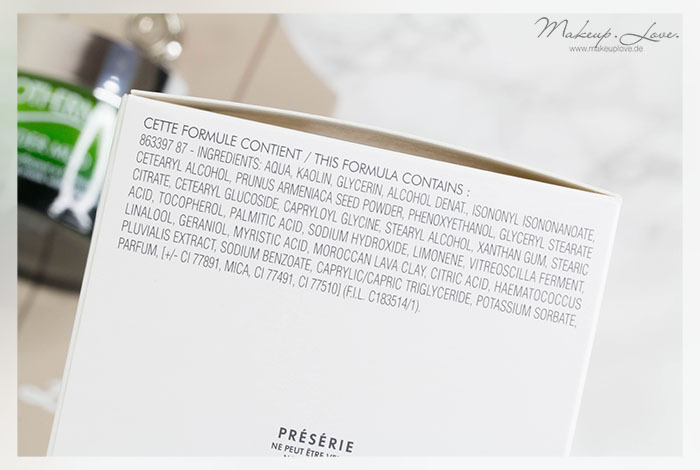 After these ingredients, we hit Phenoxyethanol, which is the first preservative in the product, and so we know we've looked at most of the key ingredients that are present in significant amounts in the product. From this, we can see that it's fundamentally a clay mask, with moisturizing ingredients, including both humectants and emollients. There's also the inclusion of Apricot Seed Powder, which is there as a physical exfoliant - so yes, this mask also does double duty as a physical scrub. Perhaps the only thing is the Alcohol content in the mask - it's higher than what I consider ideal since it's 4th in the ingredients list, but it's hard to really tell how drying the mask will be, and I imagine different skin types will probably react differently. The rest of the ingredients after the preservative Phenoxyethanol include emulsifiers (Glyceryl Stearate Citrate, Cetearyl Glucoside, Capryloyl Glycine), some of which also have skin conditioning benefits, emollients (Stearyl Alcohol, Caprylic/Capric Triglyceride), thickeners (Xanthum Gum, Palmitic Acid, Stearic Acid, Myristic Acid), Vitamin E (Tocopherol), pH adjusters (Sodium Hydroxide), buffering agents (Citric Acid), preservatives (Potassium Sorbate, Sodium Benzoate), and the advertised Ghassoul mineral clay (Morrocan Laval Clay). There are also some plant extracts that could possibly be beneficial for skin including their Life Plankton (Vitreoscilla Ferment), as well as extracts with potential antioxidant benefits (Haematococcus Pluvialis Extract), as well as some other extracts that aren't that great for skin and are likely there to contribute to the scent (Limonene, Linalool, Geraniol), as well as fragrance (Parfum). Either way, these ingredients aren't likely to be present in large amounts, and mainly there for functional purposes (e.g. to ensure the product doesn't go bad, separate, and so on). Now, I know some of you are wondering - wait, where is the Astaxanthin that was all over the product description? It's not added separately to the product otherwise we would see Astaxanthin listed as an ingredient in itself. Here, it's actually hidden inside the Haematococcus Pluvialis Extract, which is a type of algae. Haematococcus Pluvialis, or H. Pluvialis, "has a high content of astaxanthin at about 5%, which has been reported as the maximal", so as a result, it is often cultivated as a source of Astaxanthin, and there have been "numerous studies...to develop novel and efficient extraction techniques to produce high-quality (purity and antioxidant activity) extracts". Sometimes the H. Pluvialis extract is also combined with other ingredients to produce a mixture that is then sold - for example, Oryza Oil & Fat Chemical, a Japanese specialty chemicals company, sells various blends of H. Pluvialis extract combined with other ingredients, including a mix of H. Pluvialis Extract, Capric/Caprylic Triglycerides, and Tocopherol, similar to what we find in the Biotherm product. So yes, there is Astaxanthin in the mask, although given that the H. Pluvialis Extract is fairly low down the list of ingredients, it's probably in small amounts. So, now that we've looked at the ingredients, how does the Skin Best Wonder Mud fare when applied? 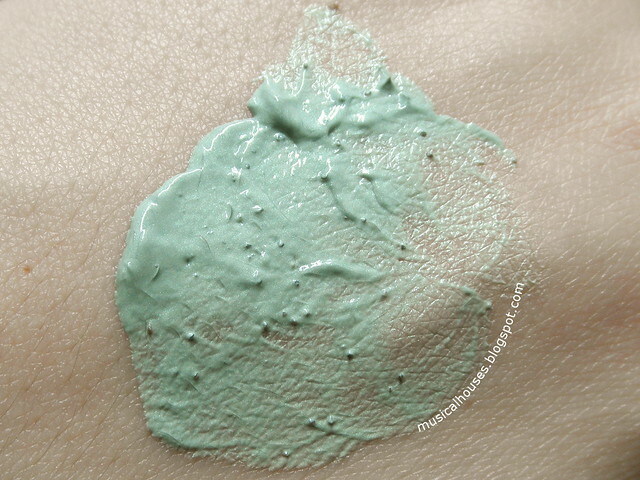 Initially, I expected this to be more like a traditional clay mask, with a more clay-like, dry texture. However, once my fingers dug into the jar, I realized this mask had a surprisingly creamy texture, almost like the Kiehl's Tumeric & Cranberry Seed Energizing Mask, which was launched at the start of this year. So, for people with drier skins who might find traditional masks too drying, this is a pretty good option to try. There was also a citrus scent that's signature to most Biotherm products, which was not too strong. 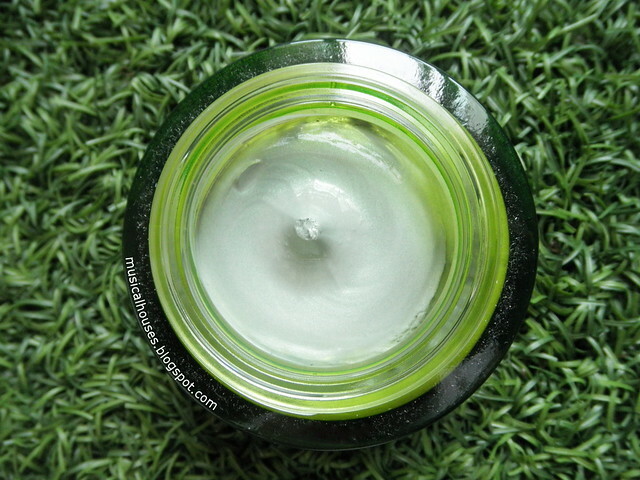 There are also little bits in the mask, which are not visible initially in the jar, but once you scoop out a bit of the mask and apply it to your skin, you can see and feel the bits. People who like physical exfoliants will really like this product too - the Apricot Seed Powder is sprinkled pretty generously throughout the mask. When I tried the mask, I found that I liked the creamy consistency. Since you leave it on your face for only 3 minutes it doesn't really dry up on the skin during that short window of time (although I assume if you leave it on for longer it would eventually get more cakey like a traditional clay mask). After 3 minutes, the mask is still moist, and easily rinsed off. The exfoliating bits, which are the apricot seed powder, are alright as far as physical exfoliants go - they're not as super-smooth as the microbeads (which are now being removed from products for environmental reasons anyway), but they're not as rough as some other physical exfoliants. The roughness of the exfoliating process is also cushioned by the creaminess of the mask, too, so it didn't feel like I was scratching at my skin. Normally I prefer chemical exfoliants because I'm not a fan of the scrubbing sensation that physical exfoliants have, but as far as physical exfoliants go, this wasn't bad at all. When rinsed off, I felt that the mask did help my skin feel more moisturized on the whole, despite my initial concerns about the alcohol content. Perhaps my only gripe with my experience with the product was the jar packaging. Of course, having to dip your fingers into the jar repeatedly isn't as fun, but my main gripe with packaging has more to do with the fact that jar packaging tends to be pretty lousy at preventing the oxidation of antioxidants and other volatile ingredients, in this case the Astaxanthin-containing H. Pluvialis Extract. I would have preferred it if the mask was in some sort of pump or other airtight container, but perhaps given the thicker consistency of a mask, that might be difficult to do. In any case, I guess since the amount of H. Pluvialis Extract in the product isn't that high to begin with, I figure I'm not losing out on too much. So would I recommend the Biotherm Skin Best Wonder Mud mask? While there may be some antioxidant benefit from the H. Pluvialis Extract, I wouldn't buy the product specifically for its antioxidant benefit, given the jar packaging and the relatively small amount of H. Pluvialis Extract. 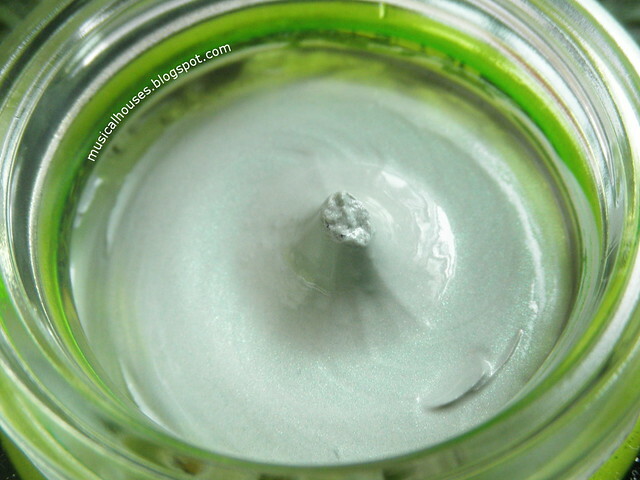 Where I think the Wonder Mud really shines is as a nice, creamy clay mask that isn't dry or cakey, which would really appeal to people with dry skins, who might otherwise find clay masks too drying for them, and also as a product that provides physical exfoliation without being too harsh. At S$59 for a 75ml tub, this is on the pricey side, but if you've been looking for a creamy clay mask, and like the idea of your mask doing double duty as a scrub as well, then this would be a mask to check out. The Bottom Line: Biotherm's Skin Best Wonder Mud does contain some antioxidant properties, but the mask does best as a creamy clay mask that doubles up as a physical exfoliator. Sounds pretty nice and the price isn't bad considering it's a fairly large jar.